A hassle-free transfer from Jodhpur to Udaipur, on the way, take a tour of the Ranakpur Jain Temple and the beautiful Kumbhalgarh fort. Enjoy a hassle-free transfer from Jodhpur to Udaipur on a comfortable chauffeur driven vehicle. Take a tour of the Ranakpur Jain Temple and Kumbhalgarh Fort. Leave aside the worries of bargaining for the rates and negotiations out of your Rajasthan tour. The city of lakes, Udaipur is known for its historical palaces and enchanting lakes. The city has an interconnected lake system which helps in the regeneration of groundwater. Udaipur City was discovered by Maharana Udai Singh II in 15thcentury, later in the 16th century, it was selected as the capital of Mewar Kingdom. The city has a lot to offer for tourists like temples, lakes, and palaces that are almost 400 years old. 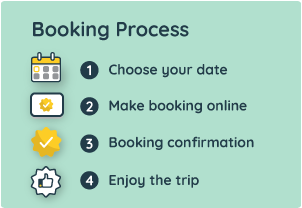 Your tour begins with a pick up from your hotel/airport/bus or railway station in Jodhpur city limits at your specified time slot (select during booking). The first half of your journey will be to Ranakpur Jain Temple which is approximately 150 km from Jodhpur and it would take you about 3 and a half hours to reach inclusive of your stops for refreshments. Upon arrival, you may take a tour of the beautiful 15th-century temple and explore its beautiful architecture and watch the resident monkeys who call the temple their home. Next up you will be visiting the UNESCO World Heritage Site of Kumbhalgarh Fort, which is about 50 km from the Jain Temple, the defensive structure is famous for its massive walls and is a part of the group 'Hill Forts Of Rajasthan'. After the completion of your tour, you will be dropped at your hotel/airport/bus or railway station in Udaipur which would be approximately 80 km drive from Kumbhalgarh Fort and would take you about 2 hours. I was grateful to have found Trodly as the price was better than on other sites.